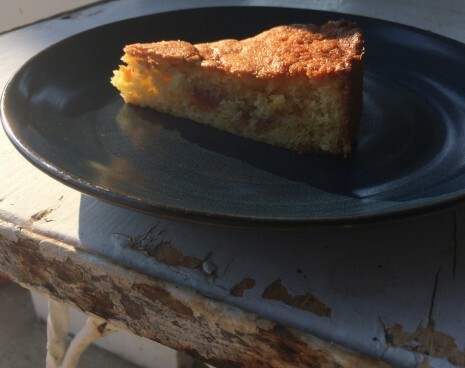 A NECTARINE GOLDEN CAKE FOR AUGUST | Jane Lear. Writing on Food and Travel. August is an edgy month, a friend just said. I’d never thought about it that way, but I know exactly what she means. Everyone is unsettled. We’re holding tight to summer, fiercely cherishing every moment, but simultaneously feeling impatient and needing to get on with things. I’ve gotten over my shock at “Back to School” ads—in fact, I found myself perusing the notebook selection at the corner drugstore with great pleasure—but still. I suppose that is why I made this cake. I have Bill Sertl, the former travel editor at Gourmet, to thank. He’s a true comrade-in-arms, and last week a few of us got an SOS from him—a friend of his was looking for a fruit-filled cake that had appeared, she thought, in the September 2009 issue of the mag. She was correct. And I don’t understand how I could have forgotten about it, for it’s the ideal cake for a nonbaker like me. There are no layers. No frosting. Just an easy batter that, when scattered with nectarine slices, rises up and embraces them with uncomplicated sunny, summery warmth. I suppose you could substitute peaches for the nectarines, but even though the two fruits resemble each other very closely, they are not the same at all. Botanically speaking, the nectarine is a subspecies of the peach; one differing gene makes the skin of peaches fuzzy and that of nectarines smooth. That aside, nectarines typically have a sharper, clearer, altogether more urgent flavor that is just right for this time of year. I’m not making this up: According to Al Courchesne, of Frog Hollow Farm, in Brentwood, California, who produces what is arguably the most delicious stone fruit on the planet, tannins in the skin are what give nectarines their pizzazz; peaches are mellower because they have fewer tannins. The texture of the flesh is different as well: As a rule, nectarines are firmer and meatier than peaches. The cake itself is buttery and tender, yet not too rich. A sprinkle of sugar on top gives it a beguiling crustiness, so it can support a spoonful of softly whipped cream. I have to say, though, I like it best absolutely plain. Its sturdy, forthright character means that you can forgo a fork and eat a slice out of hand, whether basking on the porch or out in the garden, watching zinnias and dahlias bloom their heads off. Nice for a lunchbox, too. I know one-eighth of a teaspoon of pure almond extract seems like a “why bother?” amount, but almonds and nectarines (like other stone fruits) are members of the Prunus genus, and have a powerful affinity for one another. In other words, you’d miss it if it weren’t there. 1. Preheat the oven to 350ºF with rack in middle. Lightly butter the springform pan. 4. Spread the batter evenly in the pan, then scatter nectarines over top. Stir together nutmeg and remaining ½ tablespoon sugar and sprinkle over top. Bake until cake is golden-brown and top is firm but tender when lightly touched (cake will rise over fruit), 45 to 50 minutes. Let cool in the pan 10 minutes. Remove the side of the pan and cool to warm. I love this post, just sent it to some of my editors as a great example of how to write about how food tastes. You’re a master of making flavors come alive.